← Trump Ally Rep. Chris Collins Arrested for Insider Trading – Is the Swamp Drained Now? To date, virtually nothing concrete has been done, or even started. The reason is because—to date—we insist on imagining that the “money” needed to pay for serious planning, and to begin real actions, must come, directly or indirectly, from tax-payer’s pockets. Virtually by definition, this means the “money” is not available—nor, we should admit, will it ever be. Therefore, since we insist on believing that is where the money must come from, we cannot even begin. There are a multitude of scientists and informed advocates who are now sounding alarm bells about what’s coming down the road, but not a single one of them, unfortunately, can tell an audience how their local, state, or national governments are going to pay for the actions that need to be planned and implemented. Until that changes, we are like the proverbial deer frozen in the headlights of an on-coming tractor-trailer. Fortunately, history has shown us how to get unfrozen. History has shown us that, when necessary, we can easily imagine a money-reality different than what we habitually insist is true: that money can be newly “created” to buy whatever is needed—labor, materiel, human ingenuity—to undertake and accomplish something we all recognize needs to be done for our collective benefit. Whether we “see” this alternative money-reality simply depends, apparently, on how big the fire is. The history lesson I’m specifically referring to is America’s mobilization out of the Great Depression and into World War II. As documented in the books American Default, by Sebastian Edwards, and A Call to Arms, by Maury Klein, in 1933 America was facing its own frozen-in-the-headlights-how-can-we-pay-for-it predicament: The economy then had essentially collapsed into the Great Depression. The banking system was in a death-spiral as panicking families and businesses were withdrawing their deposits for cash dollars—then redeeming their cash for the gold the dollars promised, forcing the banks into insolvency. Family savings had been wiped out, farmers had abandoned their land, businesses had closed their doors, a fourth of the working population lost their jobs, breadlines formed in every major city. At the same time, wild-fires of armed fascism were destabilizing Europe and southeast Asia. Hitler gained dictatorial control of Germany and soon began mobilizing and arming the war machine of the Third Reich. Paralyzed by its myopic political insistence on maintaining the “sound-money” (gold backed) foundations of the U.S. monetary system—even though it had rendered the system itself virtually useless—America was ill-prepared, either to climb out of the Depression or defend itself against the growing conflagrations of fascism. Half the U.S. army in 1933 could be seated in Chicago’s Soldier Field stadium—with the other half standing at attention on the football field. The U.S. Navy consisted of a few hundred left-over World War I rust-heaps, mostly in mothballs. As Germany’s Luftwaffe began demonstrating its newly minted warplanes, the U.S. Airforce did not even exist. Nor did the dollars that would be necessary build it: Where could the dollars possibly come from when America’s families had lost their savings, when America’s businesses had closed their doors, when America’s banks had declared insolvency? Sell War Bonds? Who had the dollars to buy them? Declare an income tax? Who had the income to pay it? March 4, 1933: Franklin Roosevelt is sworn in as President. March 31, 1933: The Civilian Conservation Corps (CCC) is created by the Emergency Conservation Work Act, putting unemployed young men to work in the nation’s forests and parks. May 12, 1933: The Federal Emergency Relief Administration (FERA) is created, via the Federal Emergency Relief Act of 1933, to provide work and cash relief for Americans struggling to get through the Great Depression. May 18, 1933: The Tennessee Valley Authority (TVA) is created with the passage of the Tennessee Valley Authority Act to provide affordable power and flood control, which it still does to this day. June 13, 1933: President Roosevelt signs the Home Owners’ Loan Act of 1933. The law assists mortgage lenders and individual home owners by issuing bonds and loans for troubled mortgages, back taxes, home owners’ insurance, and necessary home repairs. June 16, 1933: President Roosevelt signs the Farm Credit Act, making credit more accessible to farmers, and with fairer terms than private sector lending (e.g., lower interest rates). June 16, 1933: President Roosevelt creates the Federal Emergency Administration of Public Works, which eventually becomes known as the Public Works Administration (PWA). During the next 10 years the PWA contributes billions of dollars towards tens of thousands of infrastructure projects all across the nation. June 16, 1933: With Executive Order No. 6174, President Roosevelt authorizes up to $238 million in Public Works Administration (PWA) funds for the Navy. From these funds, 32 naval vessels are built. October 23, 1933: The Army Corps of Engineers begins the construction of the Fort Peck Dam, one of the many large Corps projects made possible with New Deal funding. November 9, 1933: The Civil Works Administration (CWA) is created with Executive Order No. 6420B, under the power granted to President Roosevelt by the National Industrial Recovery Act. By January 1934, over 4 million formerly-jobless Americans are employed by the CWA. to build 44,000 miles of new roads, install 1,000 miles of new water mains, construct or improve 4,000 schools, and much more. December 8, 1933: The Public Works of Art Project (PWAP) is created by an allocation of funds from the Civil Works Administration. Unemployed artists are hired to create works of art for public buildings and parks. They will create nearly 16,000 works of art. By 1941, fiat money—and all the things it had paid American’s to accomplish—had begun to pull the country out of the abyss. And just in time. For it turned out the New Deal had only been a warm-up exercise in the creative use of sovereign money to accomplish collective goals. Europe was in the flames of war. Germany was threatening England from a French country-side it had already invaded and occupied—and was stalking American shipping off the U.S. Eastern seaboard with its submarine “wolf-packs.” Then December 7th happened. Over the next four years, miraculously, America built—and paid for with fiat money—the largest and most technologically advanced war machine that had ever existed on Earth. The scale of the spending was staggering. The most astonishing thing is what the unprecedented spending accomplished in the long run: It transformed an entire society to confront a new reality and created, for all practical purposes, a new “America” to thrive in that reality. The American people had “paid themselves”—through the fiat monetary actions of their sovereign government—to invent an array of new technologies and apparatuses originally conceived for waging war, but which, after the war, were clearly seen to have useful applications to peaceful life as well—and they had paid themselves to build a great many factories, research and production facilities capable of adapting and producing these useful things to civilian life—and they had paid themselves to train a very large workforce of engineers, technicians and skilled workers who knew how to make it all work. This was a powerful economic brew—and it was spiced by the fact that the returning G.I.s were getting paid to go to college to explore how to make the whole thing run even better. America never looked back. Until now. We could ask what happened. We could ask why, today, we cannot marshal enough resources to rebuild the Puerto Rican electric grid and the Virgin Islands hurricane devastation. We could ask why there isn’t a national engineering effort to begin planning for sea-level rise. We could ask why the U.S. forestry service doesn’t have the budget it needs to pay American workers to clear deadfalls and underbrush from its most vulnerable tree-stands. 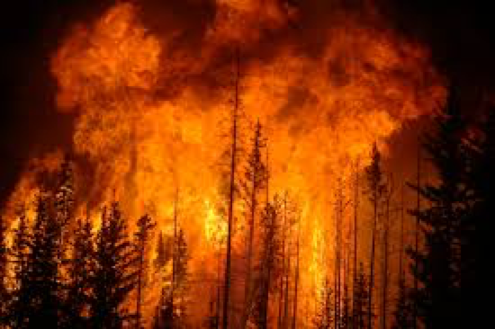 Or why we cannot imagine deploying a fleet of tanker planes to California large enough to deluge any wild-fire before it has a chance to become a conflagration. The only question we really need to ask, though, is this: How big does the fire need to be before we “understand,” once again, how we can pay ourselves to put it out? Nobody who is in a responsible position really cares and nobody else is not worried so the total result is nothing! Only when the fire reaches our very lives will we want to escape it and that only to run away. The world is behaving like a lot of drunken fools who have no sense of what is truly happening and frankly as a person approaching old age, I am not all that bothered either for myself. But for the future generations there will be a big disaster coming! Climate change is going on along with pollution of our oceans and atmosphere and these changes are disasters in the making. HELP!!! Sadly, it’s not that simple since what is, in essence, a government privileged usury cartel, aka “the banks”, can create vast amounts of new purchasing power to compete with sovereign spending for real resources. And should sovereign spending create the aggregate interest needed for the banks to inflate another bubble, guess who’ll get the blame for the resulting price inflation once the output gap is closed? Our current two-tiered money system whereby only the banks may safely and conveniently use fiat via accounts at the Central Bank is designed for expensive fiat, i.e. for the Gold Standard, not for the monetary sovereign creating and spending inexpensive fiat for the general welfare. In 1940 Congress passed a law allowing the Federal Reserve Bank to purchase war bonds. While banks, corporations, institutions and individuals all purchased war bonds during the war the Federal Reserve Bank bought the rest assuring that the war effort would never be constrained by lack of funds. I’ve never been able to find what percentage of bonds were purchased by the Feds. Does anyone else know? This and other MMT writing should be mandatory education for candidates for office as well as office-holders. Thanks for writing, today, J.D. I have not seen specific analysis done but I suspect, being a technical person, that the change cannot be stopped. The basic issue is simple. Half of the earth is continuously heated by the sun and half radiates energy to cold outer space. For many eons this process was stable when the CO2 content of the atmosphere was about 3% by volume. heat received from the sun was equal to the heat lost to outer space. Now, with the CO2 content about 4% the the heat balance is up set; we get more energy from the sun than is lost to outer space. Now this is the real issue. The earth’s biosphere has an enormous heat capacity. How long will it take to reestablish equilibrium? The time constant of the process must be in the decades. No matter what we do, warming is going to be with us for a very long time. In other words, there is no quick solution. All I want to say is, that the less we associate the ideas of MMT, sovereign spending, etc. with the magical thinking surrounding military spending, the more success we will have in achieving genuine economic progress, and improvement in people’s lives. Michael Flanigan: I appreciate this comment very much. It is a 100% legitimate complaint. Somehow, we must figure out how to frame this message more effectively—and I have not yet hit upon how to do it. But I’m committed to keep trying. You provide some interesting suggestions in this regard: e.g. comparing the stimulus of military spending with the stimulus of Medicare-for-all; comparing military weaponry with useful infrastructure. These are provocative lines of thought, and I thank you for them very much! The only thing magic about military spending is that the upper classes will spend for war even when they won’t spend a penny on anything else (themselves excepted.) That means we’re stuck to come up with examples of stimulative spending. Wars are the only examples that modern history has bothered to create. Not quite hard enough on FDR since he basically bailed out capitalism by not going far enough. Resulting in where we are today. Let it be a lesson to all: radical change or death. Suggestion of clearing forest underbrush and deadfall also highlighted writers ignorance of forest fires and their causes. Another lesson: analysis of problems and specific solutions are two different skills. We shouldn’t let the fact that we can clearly see what the broad problems are make us too inclined to assume our specific solutions are as accurate. Final problem is these simple ideas are presented with too much complexity. Money is a human construct, full stop. It’s the tooth fairy, St Nikolaus, Scientology. Everything about it is arbitrary, so if it’s not working, change it. There’s no jargon infested academic debates and studies required. There no natural laws to work around. Embracing MMT, another limiting construct, is not the answer. If human constructs stand in your way simply walk through the illusions, destroy them, by any means necessary. Wonderful, insightful, inspiring article. Many more needed along the same lines. MMT is, above all else, a profound affirmation of human agency, a clear and direct statement that we as a species DO have all we need (or can create what we need) to build a better, more beautiful world. The only constraint is the poisoned TINA thinking that has seeped into our minds, and each of us must find our own way back to mental health. MMT goes a long way toward recovery, but there are those difficult cases like me who need a breathtaking vision to fully shake off the persistent side effects of cynicism and pessimism. The globalists, I fear, have taken that phrase “drowning government in the bathtub” all too literally. Rosa Brooks’ book How War Became Everything and Everything Became the Military exposes the vast expansion and added responsibilities of the MIC, as governmental departments continue to be dismantled and privatized. She even said in a book circuit lecture that she thought the idea of Congress “declaring war” was antiquated and cute. Well, what if the very structures of Capitol Hill and the White House are now considered antiquated and cute? What if the plan all along has been to fold up this whole democratic experiment and move HQ into its new multi-billion dollar Pentagon digs? Talk about a fire, JD. This nation had better wake up fast if it wants to salvage the currency authorizing power of government and maintain its important role in the economy, before it’s no longer an option. RoswellJohn: I don’t think that the Fed bought war bonds, which were marketed to individuals. The Fed bought Treasury bonds as they do today, and capped the interest rate (until 1951) by buying them. The war bonds had a higher rate, but they were not negotiable. Surely there are many other references – but was just looking at John Ranlett- Money & Banking_ An Introduction to Analysis & Policy- Wiley (1965) – Ranlett was one of Wray’s teacher’s, which is why I took a look at this book. On page 429 he says that during the war the Fed’s holdings of government debt went from 2.5 billion to 25 billion. That was about 10% of the national debt at the time.